Today, we’re hitting the fundamentals of recording your podcast by getting an understanding of clipping, headroom, and the noise floor. These areas are important because without setting proper levels for your recording, you risk either clipping/distorting your audio or having to fix noise issues in post-production. There are two ends of the spectrum when recording and working with audio. 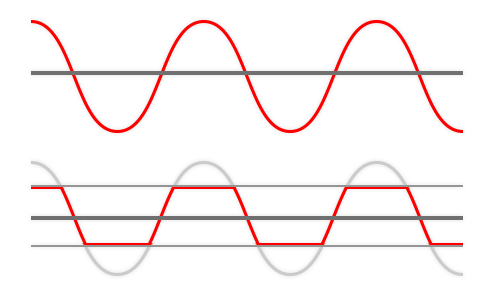 At the top of the spectrum is the clipping point - the point at which the recording interface or software can’t handle anymore level from the audio signal and begins to distort, and on the lower end there is the noise floor - the low-level background hiss/fuzz/white-noise where audio can be faded down into eventual oblivion. So when you’re working with audio, you need to be in between these two points - below the clipping point and above the noise floor. Ideally, you want to be recording at around the nominal level. The nominal level is the optimal level at which the recording device or software is designed to operate. This will be different depending on the device, but in general, you’ll be shooting for around -18 to -20dBFS on digital devices. Note: The nominal level is usually marked visually on level meter of the device interface. The difference between the nominal level and the clipping point is where you get the term headroom. So, you want to make sure you have enough headroom to account for fluctuations in the volume of speakers when recording, as well as when processing your audio in your software - or Digital Audio Workstation (DAW). Clipping and Distortion are caused when the gain (level) of your audio signal is too great for your recording interface (when recording), or your recording software (when editing/mixing). You can recognize clipping in the audio by its crackly/rough/scratchy sound. You’ll also see the red clipping signal flash on the recorder or you’ll see it when playing back the tracks in your DAW. If your audio clips when recording, it’s basically impossible to remove it. You can try to reduce some of the negative impacts by cutting out some of the lower frequencies of the clipped audio, but once it’s clipped you’re stuck with it. Which is why it’s so important to get a good initial recording that both doesn’t clip and is recorded with a high enough signal to noise ratio. When your audio clips, what’s happening is the tops of waveforms, that have reached the clipping point, are cut off at the top making them flat. Side note, if you’re familiar with different waveforms, you’ve basically turned the loudest part of your audio into a square wave. This is what a sine wave would look like being clipped. The waveforms from your podcast recording are going to be way more complex, but the same thing will happen to the tops of waveforms that are clipped. This is the industry standard for recording on digital devices and it exists for a reason. Most recording devices will also have a line, dash, or some other marking to show where the nominal level for the device is. Hit record as soon as your equipment is setup and then dial in the gain for each mic based on normal conversation. Getting levels by having each person count - “one, two, three, etc.” into the mic isn’t going to get you the normal conversational level of all of the speakers. Take into account someone laughing, getting louder as the get more animated about a conversation topic, or moving closer to the mic. All of these things can drastically change the level being recorded into your mic. A quiet environment gives you a better signal to noise ratio and allows you to set the gain where you need it to be without being worried about boosting that air-conditioner or street-noise in the background. Close enough to give you a good, strong signal without having to boost your gain and increase the noise floor needlessly. Far enough to avoid a proximity effect (which happens when you’re super close to a microphone - think), leading to an increase in the low-end frequency response. In a distance range to help mediate the volume changes caused by moving closer and farther from the mic during the recording. Note on point 3 above, this is because sound intensity and distance is a logarithmic relationship, so if you’re at 6 inches from the microphone and then move to 3 inches, you’re effectively doubling the sound level with the increase of 6dB (decibels are also logarithmic). ** Note on the note of point 3… Although you’ve doubled the sound intensity, it isn’t heard as twice as loud to our ears because of the way our ears process sound (it takes a 10dB difference for us to think it sounds twice or half as loud). But we’re getting off point, just know distance changes matter when recording so you want as little fluctuations as possible. To sum up those notes: Moving from 12 to 10 inches away from the mic while talking won’t be a big deal but moving 3 inches down to 1 inch will cause major level changes. Say you recorded your podcast audio at the nominal level - everything went great, and you’ve also finished editing and mixing your episode. But now you have all of that extra headroom in your final stereo mix and you want your audio louder. This is where mastering come in, one of the main aspects of mastering your final mix is removing that headroom and increasing the loudness of your finished audio up to industry standards. This will usually be done with a combination of multi-band compression and a limiter. If you don’t have specific mastering tools in your software, or don’t feel like digging into that right now, a standard compressor will also get the job done.